The American punitive expedition against Malolo, Fiji in 1840 by Alfred Agate. A punitive expedition is a military journey undertaken to punish a state or any group of persons outside the borders of the punishing state. It is usually undertaken in response to perceived disobedient or morally wrong behavior, either as revenge or to apply strong diplomatic pressure without a formal declaration of war. In the 19th century, punitive expeditions were used more commonly as pretexts for colonial adventures that resulted in annexations, regime changes or changes in policies of the affected state to favour one or more colonial powers. The Bombardment of Algiers by the Anglo–Dutch fleet in 1816 to support the ultimatum to release European slaves. 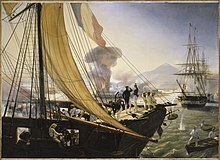 The French Navy raids San Juan de Ulua (Mexico) during the Pastry War (1838). In the 5th century BC, the Achaemenid Empire launched a series of campaigns against Greece to punish certain Greek city-states for getting involved in the Ionian Revolt. In the 1st century AD, Germanicus engaged in punitive expeditions against the Germanic tribes as repercussion for the Roman Legions that were destroyed in the Battle of Teutonburg Forest. In the 13th century, Genghis Khan, the founder of the Mongol Empire, often engaged punitive expeditions, either as a pretext or to quell rebellions against his rule. Some notable examples include his invasion of Khwarazim and his campaigns against the Western Xia kingdom. Also in the 13th century, Kublai Khan, a grandson of Genghis and the founder of the Yuan Dynasty, sent emissaries demanding tribute from the Singhasari kingdom of Java. The ruler of the Singhasari kingdom, Kertanagara, refused to pay tribute and tattooed a Chinese messenger, Meng Qi, on his face. A punitive expedition sent by Kublai Khan arrived off the coast of Java in 1293. Jayakatwang, a rebel from Kediri, had killed Kertanagara by that time. The Mongols allied with Raden Wijaya of Majapahit against Jayakatwang and, once the Singhasari kingdom was destroyed, Wijaya turned against the Mongols and forced them to withdraw in confusion. In 1599 the Spanish conquistador Juan de Oñate ordered his nephew Vicente de Zaldívar to engage in a punitive expedition against the Keres natives of Acoma Pueblo. When the Spanish arrived, they fought a three-day battle with the Keres leaving about 800 men, women and children dead. During the First Anglo-Powhatan War (1610–14), Thomas West, 3rd Baron De La Warr (1577–1618), an English nobleman was appointed Virginia's first royal governor and ordered to defend the colony against the Powhatan. Lord de la Warr waged a punitive campaign to subdue the Powhatan after they had killed the colony’s council president, John Ratcliffe. His tactics against the Indians proved effective and included raiding their villages, burning their homes, torching their cornfields and crops, and plundering their provisions. In the summer of 1614, Ottomans led by Damat Halil Pasha engaged a successful punitive expedition against Sefer Dā'yl, an insurgent in Tripoli. From 1838 to 1842 ships of the United States Exploring Expedition engaged in three punitive expeditions against Pacific islanders. The First Opium War (1839–42), in retaliation of the burning of opiate products by Commissioner Lin Zexu, which resulted in the opening of a number of ports, the cession of Hong Kong to Great Britain, and the Treaty of Nanjing. The 1842 Ivory Coast Expedition was led by Matthew C. Perry against the Bereby people of West Africa after two attacks on American merchant ships. The Battle of Kabul in 1842 was undertaken by the British against the Afghans following their disastrous retreat from Kabul in which 16,000 people were killed. The French Campaign against Korea in 1866, a response to the earlier execution by Korea of French priests proselytizing in Korea. The 1867 Formosa Expedition, a failed punitive operation of the United States. The United States expedition to Korea in 1871, in retaliation to the General Sherman incident, where a U.S. merchant ship was burned as it entered Pyongyang. The 1874 Japanese expedition against Formosa. Benin Expedition of 1897 British punitive action that led to the annexation of the Kingdom of Benin. The New York Times reported on January 13, 1897 that a "punitive expedition" would be formed to "punish the murderers of the Benin City expedition." During World War I the battle of Asiago nicknamed Strafexpedition (punitive expedition) was a counteroffensive launched by Austria-Hungary against the Kingdom of Italy, however, the Italian army was able to contain the offensive. The Pancho Villa Expedition from 1916 to 1917, led by General John J. Pershing, was an operation in retaliation against Pancho Villa's incursion into the United States. Suppression of the 1920 Iraqi Revolt against the British Mandate of Mesopotamia. In World War II, einsatzgruppen were involved in the mass murders of civilians in Poland and USSR as the punishment for the acts of resistance and collaboration with the communists. The 1979 invasion of Vietnam by China was characterised by Deng Xiaoping as an act of punishment necessitated by Vietnam's invasion of Cambodia, saying that "Children who don't listen have to be spanked.". The destruction of half of the operational ships of the Islamic Republic of Iran Navy by the United States Navy in 1988 during Operation Praying Mantis for damaging USS Samuel B. Roberts by mining international waters of the Persian Gulf. The 2016 Indo-Pakistani military confrontation began with punitive surgical strikes carried out by India. These strikes were a punitive action in response to Pakistan's inaction in curbing the activities of terrorist organisations such as Lashkar-e-Taiba and Jaish-e-Mohammad, which India held responsible for the Uri attack. ^ Stowell 1921, pp. 41–42. ^ Spiteri, Stephen C. (2013). "In Defence of the Coast (I) - The Bastioned Towers". Arx - International Journal of Military Architecture and Fortification (3): 43. Retrieved 21 December 2015. ^ "A Victory for the Chinese; Japanese Driven with Heavy Loss from Ping-yang". The New York Times. August 22, 1894. p. 5. ^ "To Punish the Murderers; Great Britain Will Send Another Expedition to Benin City". The New York Times. January 13, 1897. Retrieved 2008-08-24. The Daily News will to-morrow say that the Government has ordered that an expedition be formed to punish the murderers of the Benin City expedition. The punitive expedition, which will be prepared at Old Calaber, will be made up of men from the forces of the Niger Coast Protectorate and a contingent of sailors from the British West African squadron. ^ Ferguson, Niall (May 24, 2005). "Cowboys and Indians". The New York Times. Retrieved 2008-08-25. The United States also faces two other problems that the United Kingdom did not 85 years ago. The British were able to be ruthless: they used air raids and punitive expeditions to inflict harsh collective punishments on villages that supported the insurgents. ^ Swami, Praveen (24 November 2010). "China is treading on dangerous ground". The Daily Telegraph. Retrieved 2010-12-16. Children who don't listen have to be spanked. Gordon, Leonard (1965). "Japan's Abortive Colonial Venture in Taiwan, 1874". The Journal of Modern History. 37 (2): 171–185. doi:10.1086/239635. JSTOR 1878308. (Subscription required (help)). Stowell, Ellery Cory (1921). Intervention in International Law. Washington, D. C.: J. Bryne & Co. pp. 41–42.